Mahmoud Abbas taunted PM Benjamin Netanyahu, as the representative of Israel, "Oh, Netanyahu, you are incidental in history; we are the people of history. We are the owners of history." It should be noted that Abbas's taunting Netanyahu about history is a brazen distortion of known facts. Judean/Israeli history in the Land of Israel dates back thousands of years, and is documented by ancient Jewish and non-Jewish sources, and corroborated by numerous archaeological finds, from Hebrew coins to Jewish ritual baths. The Kurkh Monolith, for example, an Assyrian document from the reign of King Shalmaneser III (859-824 BCE), includes the words: "King Ahab of Israel sent 2,000 chariots and 10,000 soldiers." Historical revision is a backbone of Palestinian political and academic behaviour, as the leaders attempt to create a separate "Palestinian Arab" history and identity for themselves, distinct from the general Arab and Islamic history. "Palestinian" Arabs are a very recent creation, and did not exist before the advent of PLO terror in 1965. Note, for example, that under UN resolution 194 in 1948, refugees were not called "Palestinian Refugees," relating to a national identity, but were called "Palestine Refugees," referring to geography - where they came from. See also Replacement Geography and Propaganda and History Upside Down, by David Meir Levi. Someone found this wonderful piece of history - Israel in 1695. The author has no knowledge of Balfour, Hitler, Arafat, the "Palestinian" faked history. Essentially, it is a total rebuke to the post-modern theory of "a Palestinian heritage" or a Palestinian people, and strongly supports the fact that the land of Israel belongs to the Jews and not at all to the Arabs, who stole the land, and the name Palestine. 1. No settlement in the land of Israel has a name of Arabic extraction. The names of settlements are mostly of Hebrew extraction; some of Greek or Latin-Roman. In fact, no Arab settlement (except for Ramla) has had an original Arabic name to this day. Most names of Arab settlements are of Hebrew or Greek extraction which have been impaired and replaced by meaningless names in Arabic. There is no meaning in Arabic for the names Acre, Haifa, Jaffa, Nablus, Gaza or Jenin and the names of cities, such as Ramallah, El-Halil and El-Kuds have no historical or philological roots in Arabic. In the year 1696, the year in which the tour was taken, Ramallah, for example, was called Beit El, Hebron was called Hebron and Mearat HaMachpelah was called El Chalil (a name for Abraham of the Bible). 2. The land was, on the whole, empty and desolate; the inhabitants were few and concentrated in the cities of Jeusalem, Acre, Safed, Jaffa, Tiberius and Gaza. Most of the inhabitants of the cities were Jews, the others were Christian; there were very few Moslems, mostly nomadic Bedouins. Nablus (Schem) was different, with a population of about 120 people from the Moslem Natsha family and about 70 Shomronites. In Nazareth, the capital of the Galilee, there were approximately 700 people, all Christians. 3. The book totally contradicts the post-modern theory of "a Palestinian heritage" or a Palestinian people, and strongly supports the fact that the land of Israel belongs to the Jews and not at all to the Arabs, who stole the land, and the name Palestine, as well, stole from the Latin and still claim to possess even that. Did the Ottoman Empire call the land Palestine while they ruled it ? The Ottoman Empire referred to the Middle East as "the Vilayet of Beirut". But when the Ottoman Empire was defeated in World War 1, the League of Nations split up the previously Ottoman territory into Mandates (see map) and named the one that included Biblical Israel, using the Roman name. Why they did this is not clear; it was not with reference to an indiginous Palestinian people. There is a small group of Israeli historians who have the goal of re-examining the history of Zionism using government documents that have become available since the 1980s. The most prominent members are Benny Morris, Ilan Pappe and Avi Shlaim. Whatever the motives of these historians, the work of Ilan Pappe appears to provide a major weapon in the arsenal of organisations which hate and campaign against Israel, so some examination of his background and work seems to be called for. Ilan Pappe is a Marxist, who refuses to acknowledge the meaning or purposes that Zionism was created to address, ie the needs and rights of Jews to dwell secure in their ancient homeland - or any homeland. As a Marxist, Biblical arguments are obviously also lost on him. Pappe claims that all who attack the Zionist idea are silenced by Israel, but somehow he continues in post as a tenured professor in an Israeli university and is allowed to propagate his ideas to the detriment of Israel. Pappe's methods are criticised by respected historians, as he dismisses the legitimacy of historical facts and rewrites history to support his ideologically determined agenda. He has admitted to the predominance of the Marxist worldview in defining conclusions and outcomes, by asserting that, "we do [historiographically] because of ideological reasons, not because we are truth seekers." Colleague Benny Morris remarked of Pappe's latest book that, "Anyone interested in the real history of the Palestine/Israel conflict would do well to run vigorously in the opposite direction!" Pappe is widely regarded as an advocate of Israel's destruction, since his recipe for a "multinational democratic state" conforms to a PLO formula, which would result in the immediate and complete destruction of Israel. The above is only the Anti-Israel history coming from within Israel - not counting all the material from the rest of the world. ( information gleaned from articles in Wikepedia and Front Page Magazine - found using a Google search) This information also appears on Israel against Israel. Here is an excellent video explaining the history of Palestine in a visual manner. This video does not cover the establishment of Israel under International Law. Some are indifferent, some avoid confronting the horror of the Holocaust, and some actively deny the Holocaust in spite of all the evidence. The motives of any who are not willing to confront the Holocaust must be suspect. Holocaust remembrance (eg Yad Vashem) seeks to prevent a repeat by maintaining public awareness and a desire to avoid a repetition. Holocaust deniers are paving the way for the next big assault on the Jews. How do Holocaust Deniers go about it? Some, such as Mahmoud Ahmadinijad are open in linking their holocaust denial to their desire for a new Holocaust, but others like Mahmoud Abbas are less open about it. Because of such people and their agenda it is essential that Israel does not define its legitimacy merely in terms being born out of the Holocaust; if the Holocaust can be denied for long enough people will forget it and assume Israel has no right to exist! Another replacement history that is on the rise seeks to write the Temple out of history and assert that the Temple Mount never had a Temple standing on it and that it is called the Harm al Sharif or the Al Aksa Mosque. An important part of this strategy could be called Replacement Archaeology. Although Archaeology is respected in most of the civilised world, where any new discovery will halt all new construction until the site has been properly investigated, the Temple Mount is closed to investigation by the Waqf while huge works are being carried out and tons of spoil removed is mixed with garbage and dumped. Gabriel Barkay and other archaeologists are having to sort through this dumped spoil to find archaeological evidence. 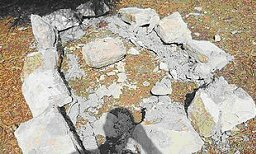 They have found many small pieces, but they are removed from their proper context and the information that may be gleaned from the position in which they were found. An article by Lela Gilbert in the September 2008 Jerusalem Post Christian Edition concluded with this paragraph quoting Gabriel Barkay. IN SPITE of these discoveries, Temple denial remains a growing phenomenon in Europe and America, particularly in leftist intellectual circles. It is seemingly supported by the fact that there are no visible remains of the temples on the Temple Mount. Barkay contends that remains were still visible in the 1960s and 1970s, but have either been removed or covered by gardens. "The Islamic Wakf says, `We are not going to let you dig, but show us any remains of the Temple.' You cannot have it both ways. If you don't allow people to dig, then don't use this absence of remains as an argument. "Temple denial is a tragic harnessing of politics to change history. It is not a different interpretation of historical events or archaeological evidence. This is something major. I think Temple denial is more serious and more dangerous than Holocaust denial. Why? Because for the Holocaust there are still living witnesses. There are photographs; there are archives; there are the soldiers who released the prisoners; there are testimonies from the Nazis themselves. Concerning the Temple, there are no people among us who remember. "Still, [to deny the Temples], you have to dismiss the evidence of Flavius Josephus, the Mishna and the Talmud; and you have to dismiss the writings of Roman and Greek historians who mention the Temple of Jerusalem. And you have to dismiss the Bible. This is, I think, way too much. 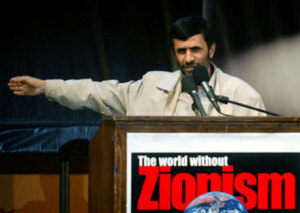 “These Islamic officials exploited permits they had received from the city’s sanitation department for the cleaning and renovation of existing graves, and instead [used the permits to] fraudulently erect fictitious tombstones in the cemetery, which is owned by the Israel Lands Administration,” “under the fictitious tombstones, plastic bottles, cigarette butts and sewage has been found." The city’s account has reportedly been refuted by the Islamic Movement, which last week accused the municipality of razing ancient tombs inside the cemetery. Earlier this year, however, The Jerusalem Post learned that the Supreme Muslim Council of British Mandate Palestine had planned to build a large commercial center directly on top of the cemetery in 1945. "International Law" is often cited against Israel in complete ignorance or denial of the real history of the establishment of Israel under International Law. This lie is quite subtle. At the time, Palestine was not a nation (certainly not an Arab nation) but an area mandated by the League of Nations for to Britain to administer. This area included present day Israel, Jordan and Syria. 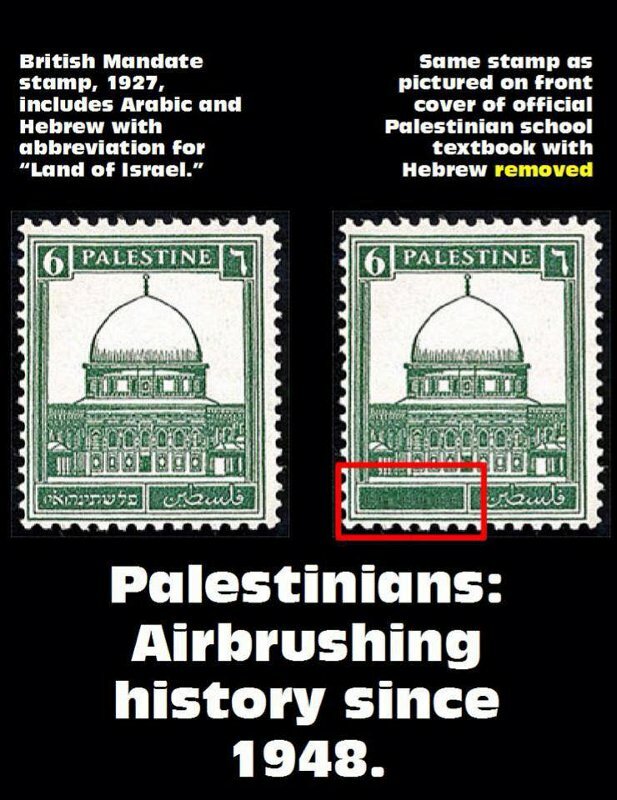 (See Land) It was inhabited by Jews and Arabs, but only the Jews called themselves "Palestinians"
The airbrushed stamp makes the false claim that Palestine was an Arab state.